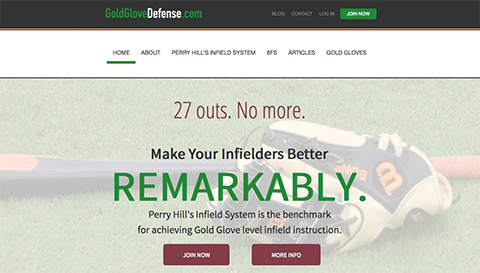 For GoldGloveDefense.com, we were very privileged to partner with Perry Hill, the current 1B Coach from the Major League Baseball Team, the Miami Marlins. Perry Hill is commonly referred to as one of the best infield coaches in Major League Baseball, and is regarded as a guru when it comes to infield defense. Coach Perry Hill needed a site that would allow him to teach other players and coaches his unique infield defense system based on the 6Fs of Fielding. The membership website allows Coach Hill to offer training videos and instruction manuals to people right at their fingertips, making this a convenient and accessible way for players and coaches to advance their infield skills.